Darren Clapperton marked his return to the Selkirk line-up with a try against Dundee HSFP (picture by Grant Kinghorn). A return to winning form and the recall of some key players has prepared Selkirk well for their visit to Troon tomorrow to take on the league leaders. 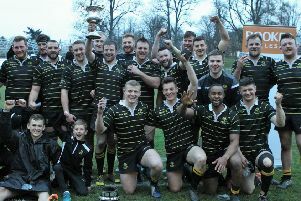 The Souters felt they’d played well the previous week at Aberdeen, only to lose 30-17, but they avenged that to an extent with a 28-8 victory at Philiphaugh last weekend over Dundee HSFP. Tomorrow, they take on Marr, who retained their lead in League One by a single point after a 33-7 win over the men from the Granite City. Selkirk have a fairly strong squad to take west with them and were bolstered at the weekend by the return of Darren Clapperton – who scored a try – and Andrew ‘Jock’ Renwick, while they are also hoping Josh Welsh will be fit again after an ankle injury. Manager Tom Ramage was reasonably confident of extracting something from the game, as Selkirk looked ahead to meeting several of the top teams in the league run-in. Looking back over last weekend, Ramage said he was happy with the way things went – eventually.